Which opens the door to a Swiftian modest proposal, one that might appeal to any billionaire independent presidential candidate who knows the art of a deal: Rather than try to win the White House outright — a long shot — an independent candidate could instead try for a king-making (or queen-making) bloc of votes in the Electoral College. With the nation divided into red and blue as it has been in the last two presidential elections, all a rich, self-financed candidate would have to do is win a big state (or two) to ensure having a king-making bloc of electoral votes: say, Florida (the decisive state in 2000), or Ohio (2004), or maybe New York (Mr. Bloomberg’s home state), or California (that of his friend, Gov. Arnold Schwarzenegger). The essential pitch to voters: Washington is broken, and we need to find a third way. Elect an independent for president. But instead of running a national campaign, the independent candidate strives to win the electoral votes of only a few states. This idea is a stretch by the conventional wisdom of American politics, of course. But before 2000 nobody dreamed the Supreme Court would decide a presidential election, either. “An Electoral College showdown, however improbable, would make the wild ride of the Florida recount look tame,” said Paul A. Beck, a professor of political science at Ohio State University. There is some historical precedent for a king-making scenario. In 1968, George C. Wallace, who rose to prominence as the anti-integration governor of Alabama, ran for president as an independent; his plan was to exploit fractures in the Democratic Party and win enough Southern states and electoral votes to foist his agenda on a major-party nominee or throw the election to the House of Representatives. He carried five states in the Deep South — not enough; Richard M. Nixon won handily. The segregationist Strom Thurmond pursued a similar strategy in 1948, winning 39 electoral votes (nowhere near enough to thwart Harry S. Truman’s storied come-from-behind win). More recently, both celebrities and rich men have demonstrated the popularity or financial wherewithal to persuade voters in this hyperkinetic news media environment to circumvent politics-as-usual: Mr. Schwarzenegger; former Gov. Jesse Ventura of Minnesota; Jon Corzine, the former senator and current governor of New Jersey; and Mr. Bloomberg himself. 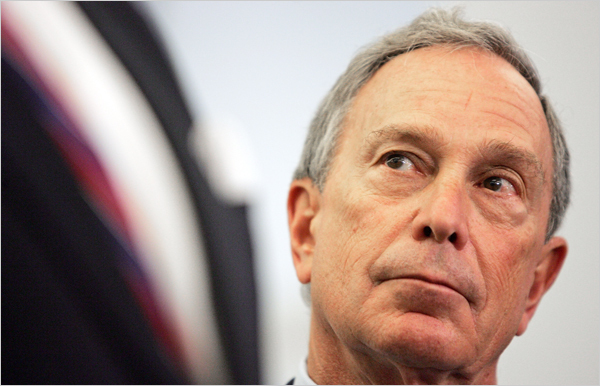 Mr. Bloomberg’s aides say he has no plans to be a kingmaker. Yet suppose an independent candidate with unlimited means carried New York in the general election on Nov. 5, 2008, winning a sharply divided vote among three home-state politicians (with Mrs. Clinton as the Democratic nominee and Rudolph W. Giuliani as the Republican). And suppose the Democratic and Republican nominees split the other 49 states and the District of Columbia in a way that left both just shy of an Electoral College majority (270 votes) without New York’s 31 votes. With his king-making bloc of votes, an independent candidate could broker a deal with one of the candidates, European- or Israeli-style. Cabinet posts could be divvied up (say, Senator Chuck Hagel as defense secretary). Specific policies and spending commitments would be agreed to (say, plans for immigration and health care, two top national priorities for the mayor). The clock would be ticking. A deal to throw the decisive electors to one candidate or the other must be struck in the six weeks before several hundred electors cast their votes in their individual states on Dec. 15, 2008. A big wild card is the loyalty of the independent candidate’s slate of electors (though perhaps they could be well-compensated by the self-financed campaign). If New York electors gathered in Albany to cast their electoral votes but began peeling off as they cut their own political deals, the grand bargain would be sunk. If no candidate achieves a majority in the Electoral College, the election would be decided in the newly elected House of Representatives, where each state’s Congressional delegation would have one vote for president. The Democrats currently dominate 26 congressional delegations to the Republicans’ 20; the 4 other states have an even split of members at this writing. If that partisan split were to hold after Election Day 2008, the Republican presidential candidate would have a huge incentive to make a power-sharing deal so the election never fell to the House. “If he gets it into the House, a Democrat is going to win the presidency, because they have the votes pure and simple,” said Mario M. Cuomo, the former Democratic governor of New York, who is noncommittal on the presidential race at this point. A few dozen extra federal judges might be needed on the bench to adjudicate all the potential legal complications. And an independent candidate might find his convictions sorely tested. “The challenge for him is how a candidate who wins some states by being above partisan politics can engage in the kind of wheeling and dealing that may be necessary for him to actually determine who becomes the president, and under what conditions,” said Mr. Beck of Ohio State. Yet for an independent-minded politician like Mr. Bloomberg who looks and speaks and acts like a presidential candidate, the lure of the free-for-all election in 2008 may prove irresistible. Being a mayor is one thing; being a president is another; and being behind the throne — well, to paraphrase one New Yorker, Mel Brooks, it’s good to be the kingmaker. I can’t help it — I’m just intrigued. This entry was posted on Tuesday, June 26th, 2007 at 6:59 pm and is filed under Politics. You can follow any responses to this entry through the RSS 2.0 feed. You can leave a response, or trackback from your own site. One Response to mm036: President? Or Kingmaker?